Arguably the most terrifying movie monster/villain ever, Jason Voorhee’s’, machete wielding maniac and emotionless psychopath, has earned his place amongst the likes of ‘Freddy Krueger’ and ‘Pennywise’ (the clown) amidst the legends of classic horror cinema. Friday the 13th is a notoriously unlucky day at the best of times, but should you be out and about on a day when Jason goes on one of his unstoppable rampages, then Friday the 13th will not only become a day not quickly forgotten, but will also be a day not easily survived. 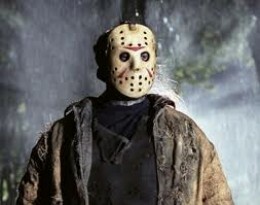 First appearing in the 1980 release ‘Friday the 13th’, debuting as the son of a camp-cook turned murderer, Jason Voorhee’s, has undergone numerous changes in appearance, but is best known for the tattered hockey mask he wears to conceal his horribly disfigured face. And with his weapon of choice being large knives and machetes, Jason Voorhee’s, is guaranteed to get the audience squirming, as he hacks apart an endless array of screaming teenagers, with each in turn dying a more bloody death than the last. Now something of a pop-cultrure icon, Jason Voorhee’s, has (appropriately) appeared in thirteen horror movies (and counting), and has even battled fellow horror cinema legend ‘Freddy krueger’ in the movie ‘Freddy V’s Jason’. 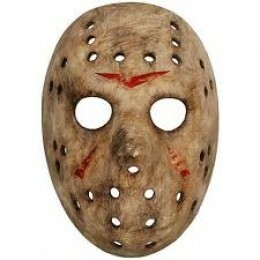 While in his original role Jason was depicted as a mentally disabled child, he is now known most commonly as the non-verbal, indestructible, knife wielding psychopath, whom locks onto his targets with unswerving persistence. A silent, expressionless, blank eyed slasher, who can’t be outrun, who can’t be hid from, and ultimately it seems, can’t be killed. Friday the 13th, Friday the 13th, Part 2, Friday the 13th, Part 3, Friday the 13th - The Final Chapter, Friday the 13th, Part V - A New Beginning, Friday the 13th, Part VI - Jason Lives, Friday the 13th, Part VII - The New Blood, Friday the 13th, Part VIII - Jason Takes Manhattan, Jason Goes to Hell - The Final Friday, Jason X, Freddy vs. Jason, Cold Heart of Crystal Lake, and Friday the 13th (the 2009 'Marcus Nispel' remake).